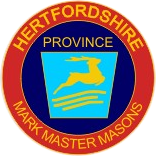 Whatever your reason for visiting the website of the Mark Province of Hertfordshire, may I welcome you to our site where I trust you will find material of both interest and worth. The Province, which was consecrated in 1885 and now has in excess of 730 members, corresponds geographically to the boundary of the county of Hertfordshire and currently consists of 38 Mark and 30 Royal Ark Mariner Lodges – two of each of which hold their meetings outside of the county boundary. This makes Hertfordshire one of the larger of the Mark Provinces within the U.K.
Our oldest Lodge is the Watford Lodge of Mark Masters No. 241 which was consecrated in 1879, with the newest being the Rudyard Kipling Lodge of Mark Master Masons No. 1947 consecrated in 2013. The Order itself is the third largest of the Masonic Orders, the Craft being the largest and the Royal Arch (Chapter) the next. The only requirement for a Craft Mason to become a Mark Master Mason is that he should have taken the three degrees of Craft Masonry i.e. he should be a Master Mason, although ironically the Mark Master Mason Degree is often referred to as the completion of the Fellowcraft Degree. 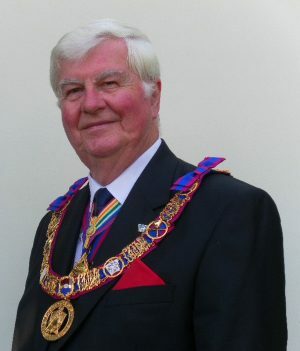 Should you decide to take an extra step and come into the Order you will be assured of a hearty welcome, especially in ‘Happy Hertfordshire’, into what is universally known as the friendly degree where ‘among Mark Master Masons you will ever find friends’. The degree itself teaches several useful lessons, among them that fraud does not and will never succeed and that perseverance in doing the right thing regardless of difficulties encountered on the way will bring its own reward. This Order is one of those administered by the Grand Lodge of Mark Master Masons from its headquarters at 86 St. James’s Street, London, SW1A 1PL and has as its Grand Master H.R.H. Prince Michael of Kent, the blood brother of the Duke of Kent, Grand Master of the Craft. Being a Mark Master Mason is one of the requirements should you wish to further your Masonic career by becoming a member of the Royal Ark Mariners, Royal and Select Masters or Allied Masonic Degrees.